Why is an armadillo covered in armor? Just how lazy is a sloth? Why does a beaver chomp through trees? Just what is a binturong? These are just a sampling of questions asked and answered with help from “beast expert” Barbara Taylor, in Yuval Zommer’s The Big Book of Beasts. Many other facts engage the reader with each page including five or six morsels identifying what makes the different animals unique. A fox will hide food to save it for later; baboons make friends by picking ticks out of each other’s fur; hippos sweat a liquid that protects them from sunburn. Dotted here and there among the 60 pages is a singular paw print which readers are encouraged to find. With the difficulty at just the right level, kids will have a bit of a challenge while still being successful in the hunt. The crowning achievement is Zommer’s excellent illustrations. He has succeeded in giving each animal a personality, creating memorable characters with wonderful expressions and body language. Habitats, foliage, and other animals that share the territory are commingled in groupings on the page spreads. Animals are engaged in various activities to give an idea of the actual positions they might be in in the wild. Drawing in a manner that is not too cartoonish nor too realistic, the illustrations have a solid sense of balance and intrigue. The final pages address the beasts of the ice age with a snapshot of extinction and what happened to these animals 10,000 years ago. And a view of endangered species (although that word is not used directly) discusses what happens to certain animals to put their survival in danger. A clever illustration about animals that venture into the city makes it clear that animals like baboons and bears really don’t belong in a manmade environment. A solution guide to the hunt and seek game, a short glossary of sorts, and an index of animals and terms round out this project. While the authors went through the trouble to included geographical locations (tigers can be found “padding through the heart of an Indian jungle,” baboons are seen “strutting around in the African Savannah,” etc. ), there is no visual context for these locations. The addition of a world map would have been a nice touch. Part educational, part hunt and seek, part entertainment, this book provides a wide appeal. Catering to the most well known beasts: tigers, lions, bears, cheetahs, beavers, etc. 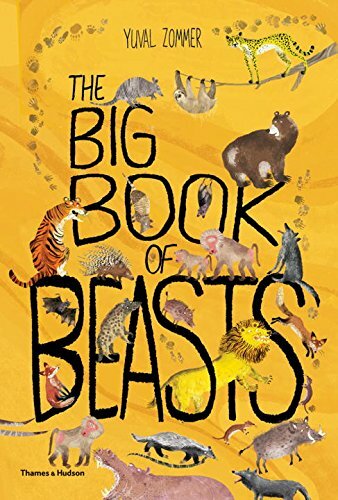 The Big Book of Beasts provides enough lesser-known tidbits to satisfy even the most scientifically savvy youngsters.